The Jupiter (S1423) is the Silvertone version of the Harmony H 49. Different finish and pickups. The hollow-body Stratotone series varied in qualty. The ones to get are the ones with square fret markers. The cheaper models with dot markers don't have adjustable truss rods and are not as good as the expensive ones. Hollow-body Stratotones are very lightweight and fun to play. This guitar was a "hopeless" pile of junk that I bought for $26 from the guy who sold me my Harmony H 15. I originally bought it for the parts but then I thought it might be fun to try to restore it. The finish was stripped and the guitar refinished with BMW black metallic acrylic laquer. The cracks in the side were repaired (by Ruokangas) and all the metal parts were polished. The non-original tuners were replaced by Grover Sta-tites which are similar to the originals. The fretboard was in bad shape and came loose from the neck as a result of a previous owners excessive tightening of the truss rod. I found a NOS fretboard on ebay which was installed (by Ruokangas). The missing knobs and PU switch were replaced and a badbanana repro logo was installed. 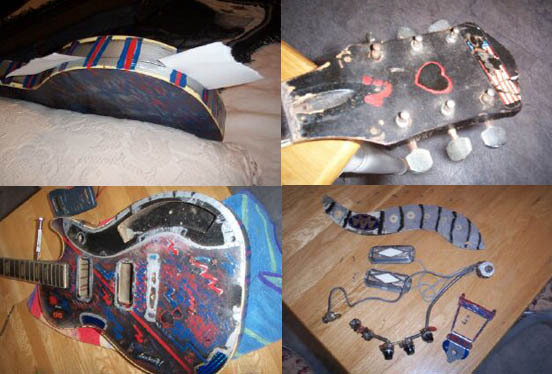 Sounds easy but this guitar needed a lot of work and money to get into its present condition.